The University of Manchester Library has begun moving its digital Special Collections to the AWS cloud with the help of Preservica’s cloud based digital preservation and access system, deployed in April. As one of only five National Research Libraries in the UK, the University of Manchester Library holds one of the world’s outstanding collections of rare books, manuscripts, maps, archives and visual collections, which are being digitised to make them more widely available to the academic and research communities. Chronologically, the library’s collections span many centuries, from the 3rd millennium BC to the 21st century, encompassing a wide range of formats. Virtually every medium that has ever been used for writing can be found in its collections, including papyrus fragments in many languages. 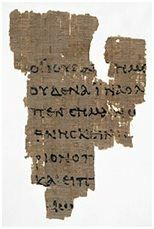 The most famous fragment is the piece of St John’s Gospel, which is believed to be the earliest example of New Testament writing in existence. Physical objects are being photographed, documented and archived using the Preservica cloud-based digital preservation platform. The University Library did a three-month pilot test of the Preservica platform in early 2015. Preservica was selected from a series of vendors, and the platform was deployed in April. Training on the platform was conducted in June and the digital programmes team have now begun moving what will eventually be 30TB+ of files in to the system. The University Library is looking forward to using the Preservica system to help make its Middle Eastern studies collection more widely available. Middle Eastern Studies have been offered at the University since 1851 and Iranian studies has been a key part of this since the late 19th century. Its collection of Iranian newspapers and periodicals offer unique insight on the minute details of historical developments of major consequences, such as the Coup of 1953, the Revolution of 1979, or the “Tehran Spring” of 1999-2002. Over the coming months, the Library’s team of archivists, photographers and IT specialists will work to digitise and ingest files in to the Preservica platform via the Preservica Bulk Upload Service, which works in conjunction with AWS Import/Export Snowball to accelerate moving large amounts of data into and out of the AWS Cloud.